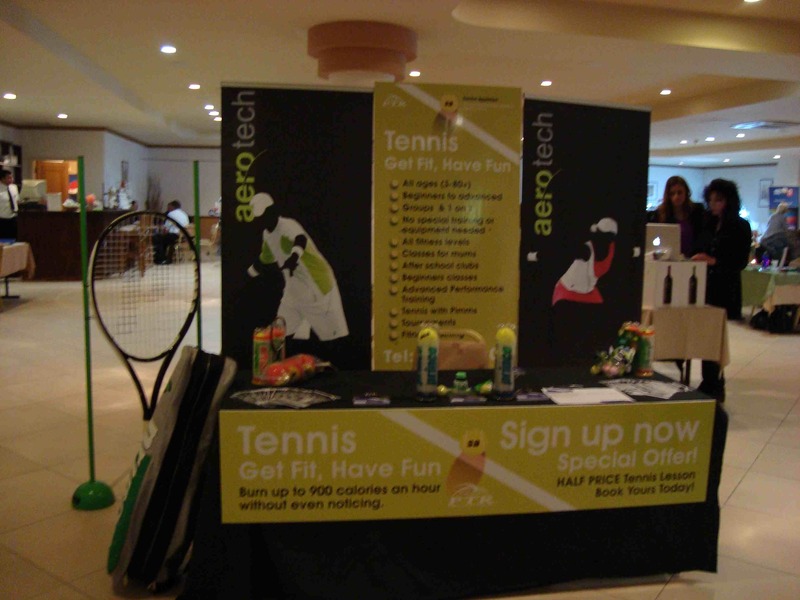 On Sunday, Sacha Appleton Tennis Coaching was on display at the Health & Wellbeing Festival in Pafos. A bright black and green combination stand stood out in a prime position by the entry. Interest levels were high and attendance was good for the 2pm introductory tennis lesson. I certainly enjoyed the show and would like to thank everyone who came to see me. I would like to give an especially big thank you to Nasos at Tennis Point for all his help – the prince roll up posters were superb and the huge Prince Tennis Racquet went down a storm. This entry was posted in Uncategorized and tagged Aphrodite Hills, Baghdatis, Cyprus, Cyprus Tennis, Cyprus Tennis Coach, Cyprus Tennis Federation, Learning Tennis, Play Tennis in Cyprus, Tennis, Tennis Academies in Cyprus, Tennis Academy, Tennis Centre, Tennis Club, Tennis Clubs in Cyprus, Tennis Clubs in Limassol, Tennis Clubs in Paphos, Tennis Coaching, Tennis Courses, Tennis Equipment, Tennis Holiday, Tennis in Cyprus, Tennis in Limassol, Tennis in Pafos, Tennis in Paphos, Tennis Lessons Cyprus, Tennis Lessons in Cyprus, Tennis School, Tennis Tournaments in Cyprus, Womens Tennis by Paphos Tennis Coach. Bookmark the permalink.